OTTAWA — When voters in Prince Edward Island go to the polls next week, they’ll be making their choice without any input from Prime Minister Justin Trudeau. 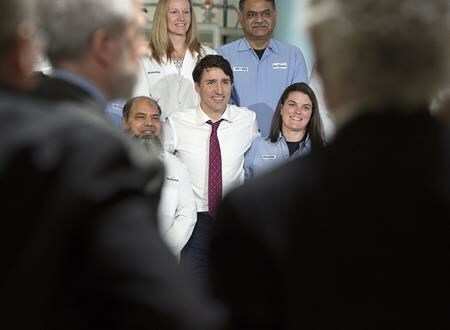 “Before, when Trudeau came to town, it was bedlam because people were so excited when he was around,” said Don Desserud, political science professor at the University of Prince Edward Island, who described him as an asset to his party over the first three years of his mandate. PMO officials have said Trudeau prefers to steer clear of provincial campaigns, although he did lend his support to a provincial byelection effort in Ontario in 2016. And he visited P.E.I. on behalf of MacLauchlan’s Liberals in 2015, before becoming prime minister. Some voters in P.E.I. have expressed anger and frustration with how Trudeau and his government have handled the affair, while others are just disappointed with his record as prime minister, say Liberals and Conservatives alike. This rise in anti-Trudeau sentiment is not only manifesting in P.E.I., but also across Atlantic Canada, said Donald Savoie, Canada research chair in public administration at the University of Moncton. “It’s pretty clear to me and to many Atlantic Canadians that (the Liberals) are facing some pretty strong headwinds,” Savoie said. He pointed to episodes over the last few years that some voters see as Atlantic Canada getting short shrift from Ottawa, including the cancellation of the Energy East pipeline, a dearth of Atlantic MPs in cabinet and the decision to name Toronto MP Navdeep Bains as head of the Atlantic Canada Opportunities Agency, rather than someone from the region. After handing Trudeau all 32 seats in Atlantic Canada in 2015, voters expected better treatment, Savoie said. The last time P.E.I. voters went to the polls in a provincial election was May 2015, just five months before casting their federal ballots. Stephen Harper was still in power and deeply unpopular in P.E.I., thanks in part to his Conservative government’s cuts to employment insurance, reductions in federal jobs and lingering resentment over his talk years earlier of a “culture of defeat” in Atlantic Canada. Desserud said he’s not convinced all is lost for the federal Liberals. Conservative Leader Andrew Scheer’s ties to the former Harper government and close connection with Alberta premier-designate Jason Kenney, a former Harper acolyte who has promised a referendum on equalization, won’t play well in a region where three of the four provinces rely heavily on equalization payments. Savoie, for his part, isn’t so sure.